Big Boss is a sophisticated wheel designed with the more advanced ceramic artist and the college classroom in mind. Clay Boss, with its smaller motor, is designed for the entry-level ceramicist. Both wheels are mounted on a sturdy steel frame. Table size is 26" × 21" (66 cm × 53 cm) with a height of 19½" (50 cm). The splash pan, included with every wheel, has full circle coverage. Both wheels feature the Speedball 14" (356 mm) steel wheel head, electronic circuitry for maintaining wheel head speed under varying loads, and a foot pedal with solid state variable speed electronic control. Also included are two bats and an instructional DVD. Warranty — Speedball guarantees quality with their full 10-year parts and labor warranty at factory. 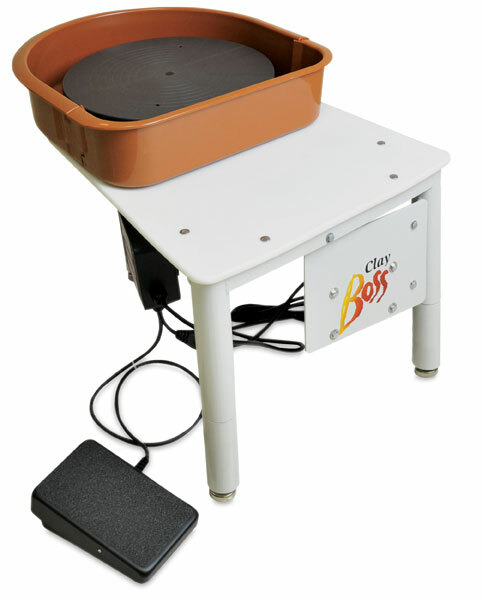 Clay Boss — All the same features as the Big Boss, but with a smaller .5 HP industrial motor that can center 100 lbs (45 kg) of clay. Big Boss — Its powerful 1.0 HP rated industrial motor has the centering capacity for 175 lbs (79 kg) of clay.